When you play a stringed instrument, the strings vibrate against the soundboard, amplifying the sound created by the string. The vibrations involved are tiny, as little as a millionth of a meter, and that's why researchers got out their lasers. By shooting laser beams at a soundboard during vibration, it's possible to track all the minute movements that create an instrument's acoustics. The process is rather awesomely called "holographic interferometry", and you can see one of the results up top. "Guitar-making is a compromise between stiffness and flexibility. The struts on the underside of the soundboard help to create a lightweight but strong plate which creates lots of sound in response to the vibrations of the strings. 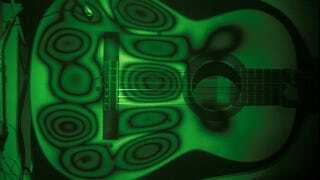 At low frequencies, the guitar plate moves back and forth not unlike the piston of a loudspeaker. The bright line near the ribs is a nodal, or non-moving, line. This mode of vibration creates large volume changes in the air and produces a lot of sound radiation. At higher frequencies, the plate starts to divide into distinct patches separated by nodal lines. Sound radiation from these modes is not as strong, but these modes 'colour' the sound to give each instrument a unique voice. At even higher frequencies, the vibrations split into smaller and smaller vibrating patches. Studies of these vibrations and the way they convey energy of the vibrating strings as sound to the listener can assist makers to 'fine tune' the tone quality of their instruments." For more awesome images that show how sound vibrates in various instruments, check out the gallery at BBC News.